This year Co|So is welcoming 21 new members into the Copley Society of Art. Today’s blog post we are giving you a sneak peek into the New Members Show 2019 by revealing four artworks before the opening reception this evening at 5:30pm. Carol Caradimos says that her goal is to learn about life and humanity through painting, as she believes that art reflects larger themes of human nature. This painting titled Dunes in Summer depicts a warm and windy landscape, the painterly beach grass waving gracefully against the bright blue and cloudless sky. Janine Robertson’s inspiration for her work comes from the marshes and woodlands in the northeast, particularly those along the New England shorelines. She often begins her paintings en plein air and then completes them in her studio, both allowing her to ensure a strong composition and explore the effect of light and time on the landscape. Her paintings are often created on copper or aluminum which emphasizes the luminosity of her landscapes. 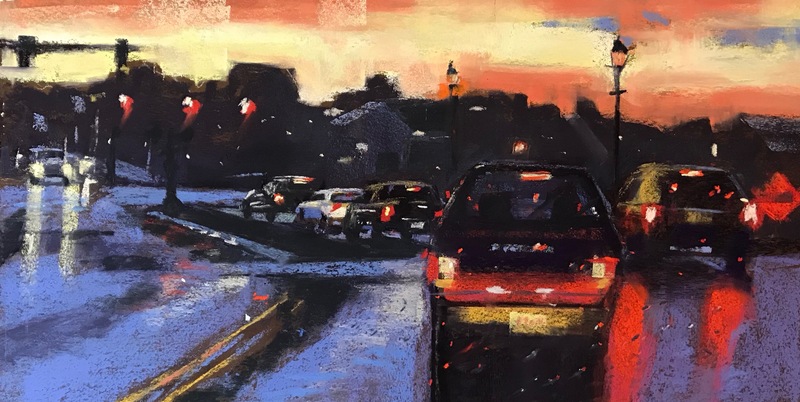 Janet Schwartz's inspiration comes from many reference photos from her former long commute to work. Although she has more time for her artistic endeavors now, she continues to find inspiration by capturing spontaneous photos. These images often involve the movement and action of urban evenings. Janet tries to inspire her viewers to find beauty in the details of everyday urban life that may have otherwise been missed. To Sean Witucki painting is as important as breathing. To him, the final piece is less important than the path taken to get there. As a painter he always challenges himself to reach new levels of skill and beauty, efforts inspired by philosophy of the Hudson River School. This painting depicts the wonderous Niagara Falls. The waterfall is lite up by moonlights while a fire roars nearby.